Thanks to Dr. Steinman, you can now wear your insides on the outside. Plastic surgeons doesn’t hate him because of malpractice, or that he is operating without a license. It’s not even his one-of-a-kind take on medical ethics. They hate him because he makes individuals like yourself look exactly like they feel. 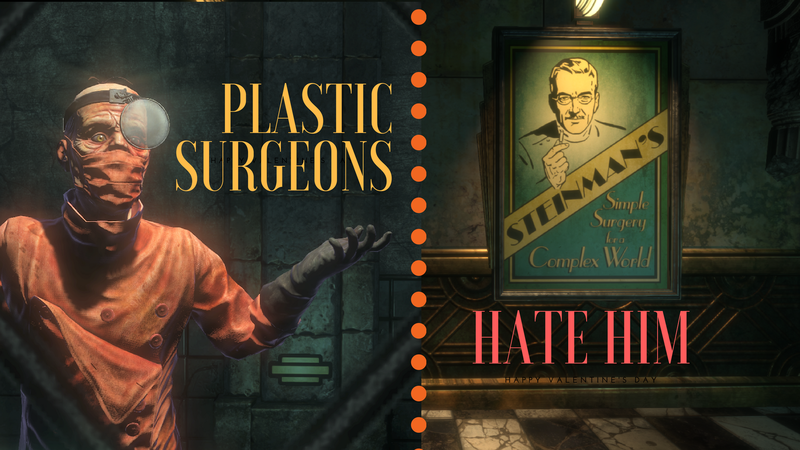 Check out these posters, confirming Steinman is the go-to-guy for cosmetic enhancements. in the Medical Pavilion and transform your look today. Disclaimer: Game Cosmos Press have not fact-checked the ad or anything in it, we just show it (Steinman pays us not to ask questions. He promised we’ll get the money soon). It may or may not contain accurate facts. Rapture currently has no department handling complaints. Dr. Steinman’s asked us to direct those with legal questions to this link.